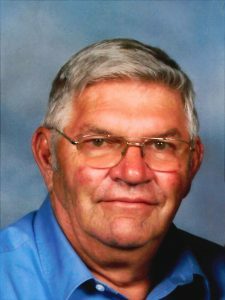 Emil D. Sobota, 71, of Schuyler, died Sunday, January 8, 2017 at david place in David City. Mass of Christian Burial Thursday January 12, 2017 10:30 A.M.
Emil D. Sobota, 71 of Schuyler passed away January 8 2017 at David Place in David City where he was a resident for 4 years. Emil was born in Columbus, Nebraska on June 5, 1945 to Emil J. and Eleanor (Svec) Sobota. He graduated from Schuyler High School in 1963. He served 6 years in the National Guard. On May 14, 1966, Emil and Donna Loseke were married at Holy Trinity Catholic Church of Heun. Emil was a life-long farmer. After retiring from farming he was employed at Schuyler Co-op for 6 years. He was an Honorary Life member of the Knights of Columbus, a member of the Catholic Workman Lodge, Eagles Club of Schuyler, and the District 1R School Board for many years. He served as a trustee and member of the Parish Council at Heun. Emil was always ready to share a beer and shoot the breeze or play cards. He is survived by his wife of 50 years, Donna; his children Robin (Eric) Stec of Omaha, Mark (Lori) Sobota of Greenwood, Matt Sobota (special friend Laura Cuda) of Schuyler and his grandchildren Morgan, Malorie, McKenna, Luke, Logan, Landon, Levi Sobota, Keaton and Kathryn Stec; brothers John (Sharon) Sobota, Joe (Fran) Sobota, sisters Mary Ellen (Greg) Hogel and Ann (Jerry) Leever and sister-in-law Jean Sobota and many nieces and nephews. He was preceded in death by his parents, daughter Holly in 2013, 3 sons in infancy and brother Frank Sobota. The family wishes to extend their gratitude to the staff at David Place in David City and AseraCare Hospice for caring for Emil.